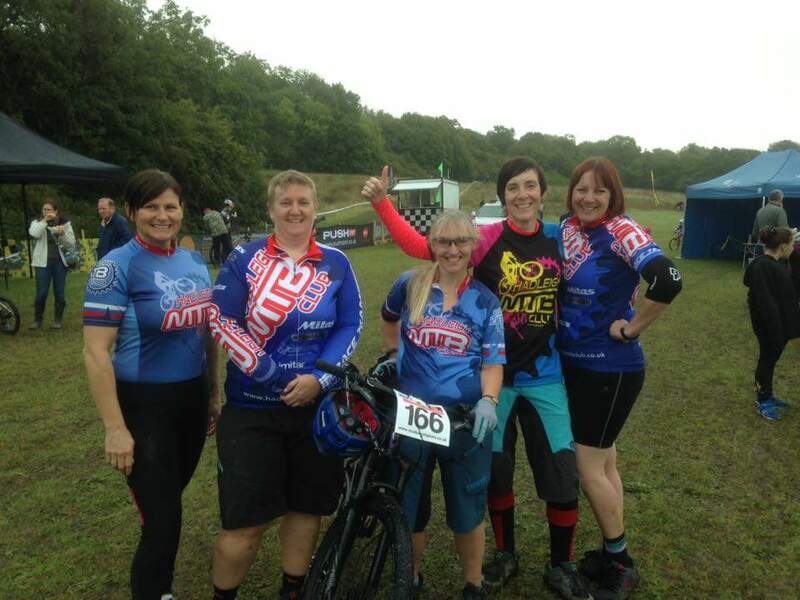 Back in August, HMTBC race team manager and Coach Kevin Darragh started the women’s rookie race squad. 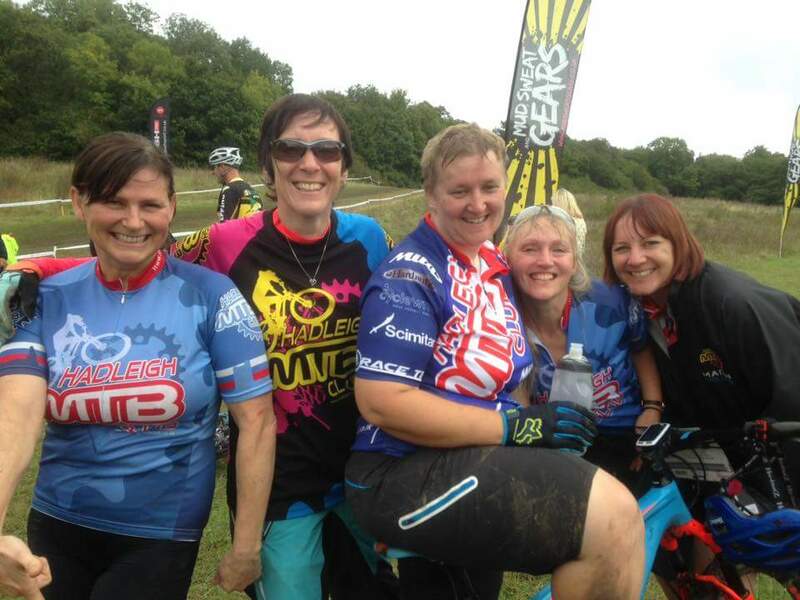 The aim was to encourage more women and girls into off road competitive cycle sport. 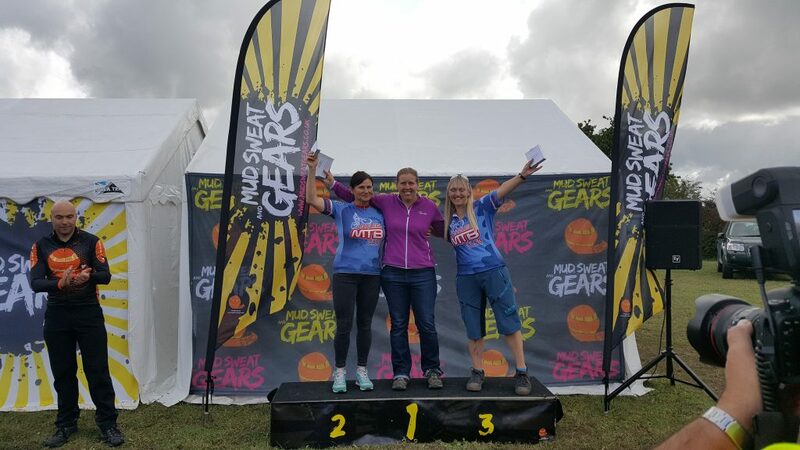 During our coaching sessions, we received cycle fitness advice, basic cycle skills and some advanced MTB skills to allow us to build our confidence to enter and participate in the regional Mud Sweat and Gears MTB race at Langdon Hills. In total, 5 women from HMTBC had entered into the Open female category, 4 from the rookie team. The morning of the race had arrived. Having marshalled at the cyclocross race at the same venue the day before, I knew trail conditions had probably worsened overnight due to the rain. We arrived early as Kevin had kindly agreed to take us all around to look carefully at all of the A and B lines. The rain had indeed left the trail muddy to say the least. The trails were super slippery and the descents were rather challenging but Kevin gave great advice on lines and positioning which calmed my nerves. He also dried my tears of frustration! Thanks Kev. A quick coffee and a pre-race photo outside the club gazebo before it was time to be gridded. I was nervous but excited to be called up to the start. We all chatted on the line which settled nerves. Due to conditions it was decided we only had to complete 2 laps. A good luck from G on the start and then we were off! Conditions under tyre were so wet I spent a lot of time trying to walk up the hills and trails but I was made to feel better when lots of other racers also did the same. I jumped back on the bike whenever the trail became dry and enjoyed some single track fun. My overall aim for this race was to face the challenge of the hills and to complete one lap. I know I could have done more on a drier day but I couldn’t face another round of mud running with my bike so stopped after one lap. Overall, all of the ladies in the rookie squad finished safely with smiles on their faces, despite a few scratches and cuts. Pauline smashed it and came 2nd, Christine 3rd. Jane came in 4th (although she got 2nd overall in the 2017 series standings), Lisa 5th and myself 6th out of 6 in our category. Im so proud to have raced alongside these ladies. Such a supportive and friendly bunch. Everyone gave it their all and came off the track buzzing! Its safe to say we shall all be back to try MS&G another day. Thank you to everyone there who cheered us round. It really does make a difference. Thank you to all of the other HMTBC race family members who always offer words of advice and a well done. Thank you to our super polite youth racers who all offer words of encouragement as they pass you in the woods. Super proud of you all. Finally, a huge thanks to Kevin Darragh for his superb coaching and confidence building. I don’t think I could have done it without his knowledge and support, his calm demeanour and his winning smile.